Kay Childs-Smith is not sure whether she would be alive today if she never sought help from National Jewish Health. A horrible asthmatic episode that began in March 1983 went on for months, prompting Kay to finally take action in July when her condition deteriorated to the point where daily tasks became nearly impossible. Unable to make the trip to Denver by car from her home in Riverside, Kansas, Kay, then in her 50s, boarded a plane and flew to Colorado. "I was so pitiful the crew at the airport brought me a wheelchair because I wasn't breathing well," says Kay, now 89. "After checking into a motel, I took a cab to National Jewish Health, and there were tears in my eyes because I had that much confidence that I was going to get better." "I was an emergency admission," she says, noting hospital staff went to her motel room to get her belongings. "They put me on an IV and gave me 80 milligrams of prednisone a day to help improve my breathing." Kay only expected to be gone for a week. She ended up staying three, a reflection of the institution's patient-centered care model in which multidisciplinary teams consisting of physicians, nurses and other health care professionals spend all the time necessary to accurately diagnose, treat and educate each patient who visits National Jewish Health. She slowly improved and remembers having a tight agenda every morning that included physical therapy and educational sessions designed to teach her how to manage her condition. Kay says one of the most important lessons she learned was to speak up and be assertive when talking to physicians. She also learned what it is like to have asthma, a condition she never wanted to admit having. "I just didn't want to be an asthmatic," Kay says. "I had bronchitis and I would wheeze. That was how I described what I was going through. I was in denial." To show her gratitude to National Jewish Health, the No. 1 respiratory hospital in the nation, Kay has funded two charitable gift annuities, which provide support to the hospital and fixed payments back to her for life. She also decided to include a gift in her will as a legacy to the institution. 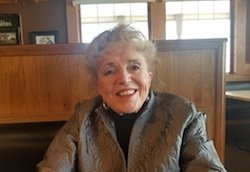 "I really don't know what my life expectancy would have been, back in 1983, if I had gone without the care of National Jewish Health," Kay says. "The people at the hospital rescued me, and I can think of no other way to express my appreciation or recognize your excellence than to give back." Kay encourages others to donate to the hospital because it consistently demonstrates excellence. "There are other charities that you can donate to, but you don't get to see the results of your gift firsthand like I did when I was a patient." If a member of your family was struggling to breathe, as in Kay's case, imagine how important expert care would be in providing quality of life to that individual. Consider supporting National Jewish Health with a gift, such as a charitable gift annuity, this year. To learn more about giving to National Jewish Health contact Gordon Smith, MBA, CFRE at giftplanning@njhealth.org or 1.800.423.8891, Ext. 6549.